A recent addition to the Mennonite Heritage Center collections is a post card photo of the Mennonite Home for the Aged at Frederick, Montgomery County, circa 1905. Notice the American flag flying prominently from the cupola. In the early 20th century, before the World Wars, churches of the Eastern District Conference often displayed flags. The post card is a gift of MHC Trustee Emeritus Ray K. Hacker. The catalog record can be viewed here. It joins other images in the Frederick Mennonite Home Collection, including this view from around the same time. 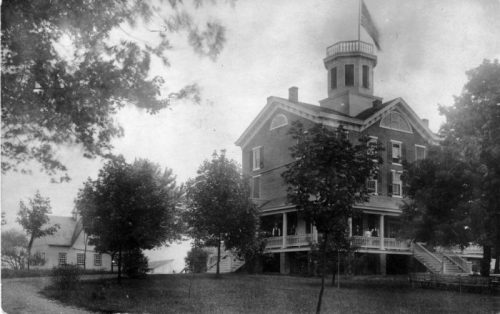 In this photo, a set of shutters are open on a cupola window, and a man stands atop it. The Mennonite Home building, originally built in the 1850s as an academy–the Frederick Institute–by prosperous farmer Daniel Bertolet and neighbors, was the finest building in the local area, and still today presents an imposing edifice along Route 73 west of Schwenksville. First called the “Mennonite Home for the Aged”, it was an impulse purchase by Rev. N. B. Grubb of First Mennonite Church of Philadelphia. He had been appointed by the Eastern District Conference to propose solutions for care of the elderly and homeless, but did not have their approval to purchase this specific property. When it was done, the conference did accept the property and began to operate a home there in 1896 for elderly Mennonite ministers, mission workers, and others who had no place to go. This was one of the earliest institutions organized by Mennonites in eastern Pennsylvania. Residents and workers of the Frederick Home with Rev. J. W. Schantz of Schwenksville (bottom right corner), circa 1910. Dining room, Frederick Mennonite Home, photographed in 1955 by John Spangler. Resident Jacob Unruh, who was born in South Russia, enjoying flower beds at the Home, September 1956, a few months before his death. Photo by John Spangler. In 1957, the Home underwent a major renovation and expansion. Large pillars were added to the front of the 19th-century building, creating the facade we are familiar with today. At this time, the American flag was absent. All these slides taken by John Spangler, along with numerous others, are in the collection at the MHC. This earliest of local Mennonite institutions has provided quality care for 120 years. Known today as Frederick Living, it continues to be a vibrant senior living community in western Montgomery County. Today, once again, an American flag flies prominently overhead.